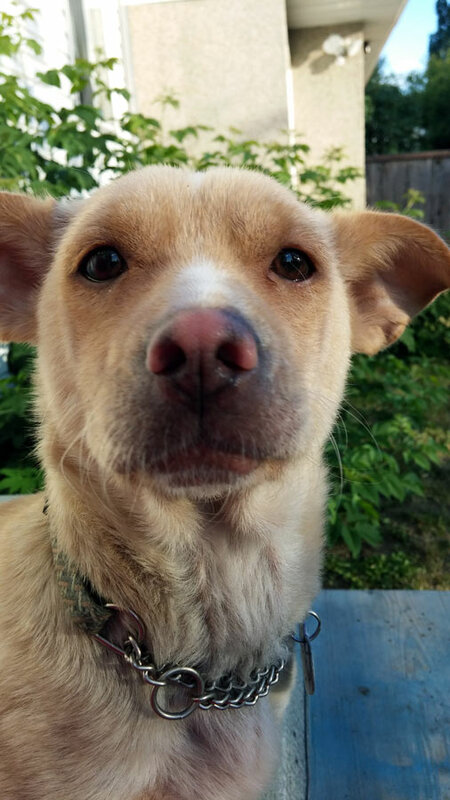 I was looking at Prince George Freecycle last night and that is where I found a lady who posted that she had 2 puppies to give away. One of the puppies is the one that we rescued from this home and need help for. When I was talking to the lady she said that the puppy was 11 months old. To me there is no way that she is 11 months old. She still her baby teeth. To me she is more like 3 months old. She was only 10 lbs. She looked very sick and thin. When we got to the woman's house to look at the pups the woman came to the door with the pup in her arms. We were not allowed to go in the house. I asked, "Where did you get the pups?" and was told that they were got from a guy who came to Prince George from Burns Lake B.C. I asked if they had food for the puppy we wanted and they said No, which made me question why they would have puppies. The pup smelt like someone had spilt beer or had vomited on her she reeked so badly. Also when we were holding her at that house the woman said she gave her a bath but to us it didn't seem like it because her fur was so crusty and coarse and covered in feces. When we brought her home we gave her a bath and named her Baha. Baha's condition is horrible. 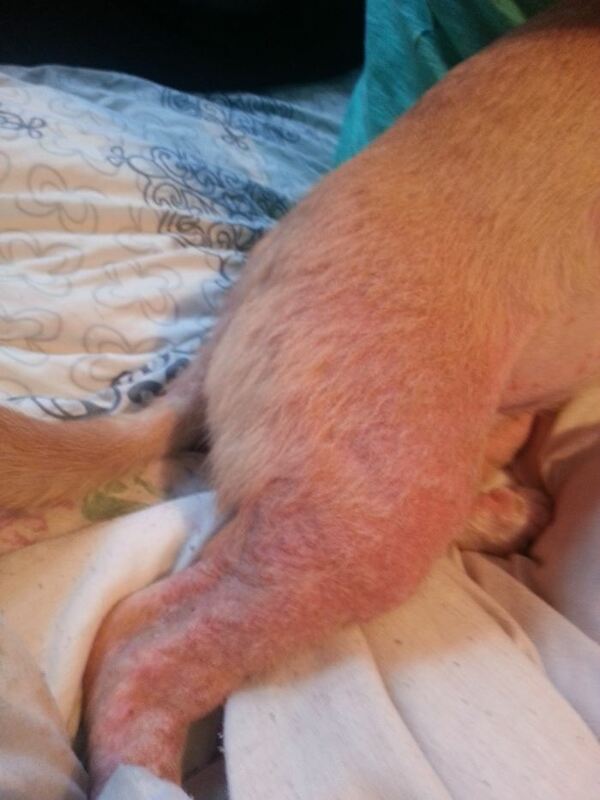 She has sores on her tummy, her legs, muzzle, and her eyes are red all around the edges. She has scabs on her stomach and legs and her muzzle from scratching so much. 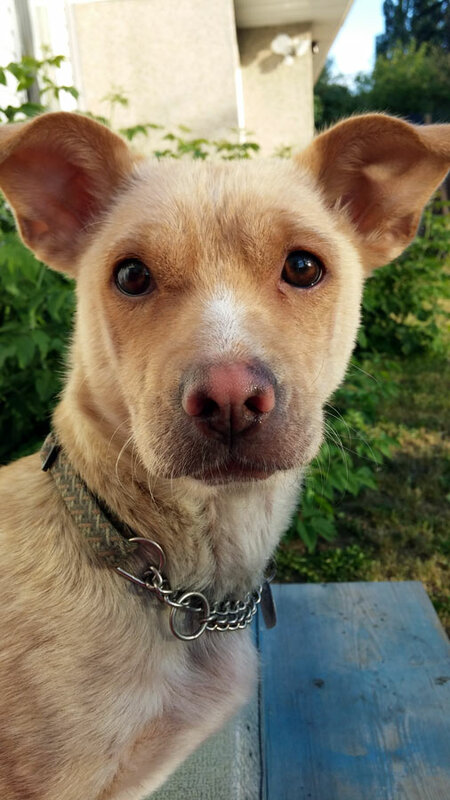 We contacted the Prince George SPCA which had stopped by the house taking pictures. The SPCA said that they will be opening an investigation against the woman and they also mentioned that she has a 'no animals order' against her." A 'no animals order' very likely means that the party has been prosecuted for cruelty, found guilty, and a judge has issued a court order restricting the convicted person from owning animals for a set period of time, anywhere from six months to life. 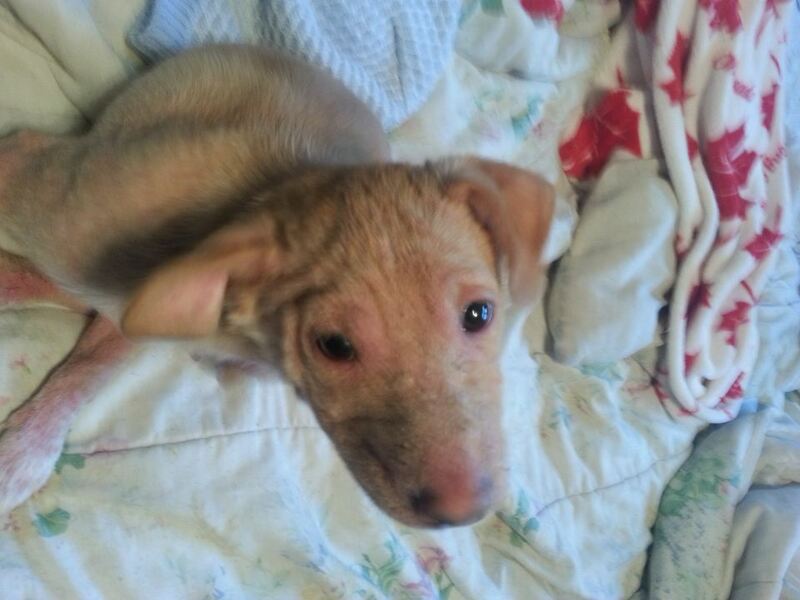 A 'no animals order' would allow the SPCA to quickly seize the second sick pup. It's seems unlikely the SPCA wouldn't have seized the pup. If it did, I for one would like to know what it did with it. The SPCA's past make it reasonable to suspect that it killed the pup. Firstly it is a Pitbull cross and secondly it's so sick that it would require time and money to make it well. The SPCA does not need to produce the animal in a cruelty court case, it only needs to produce its vet's report describing neglect so severe that it is a chargeable offence under the Prevention of Cruelty to Animals Act. That second pup may or may not be alive still. AAS would like to know but has no expectation of being told. AAS quickly gave the okay for Baha to be taken to our vet in Prince George. 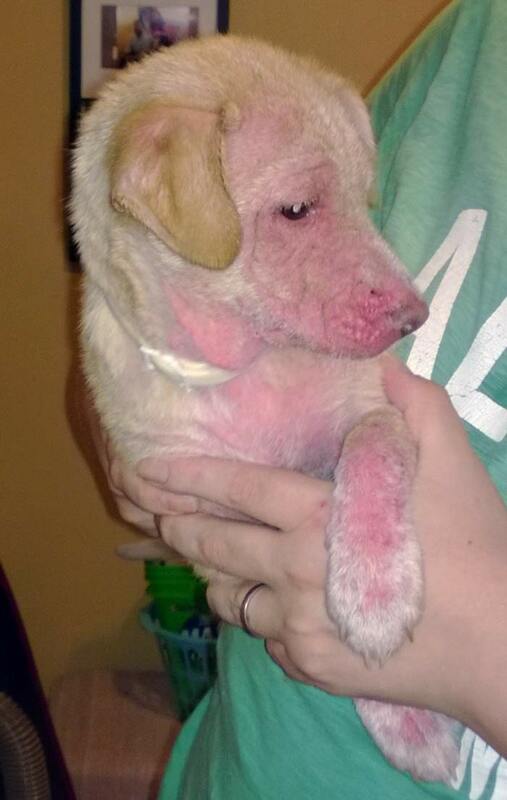 She had what we suspected from the photos: demodex mange so severe that the treating vet, a man with many years of practice, said he had never seen a case so bad. She also had puritis, a secondary skin infection. 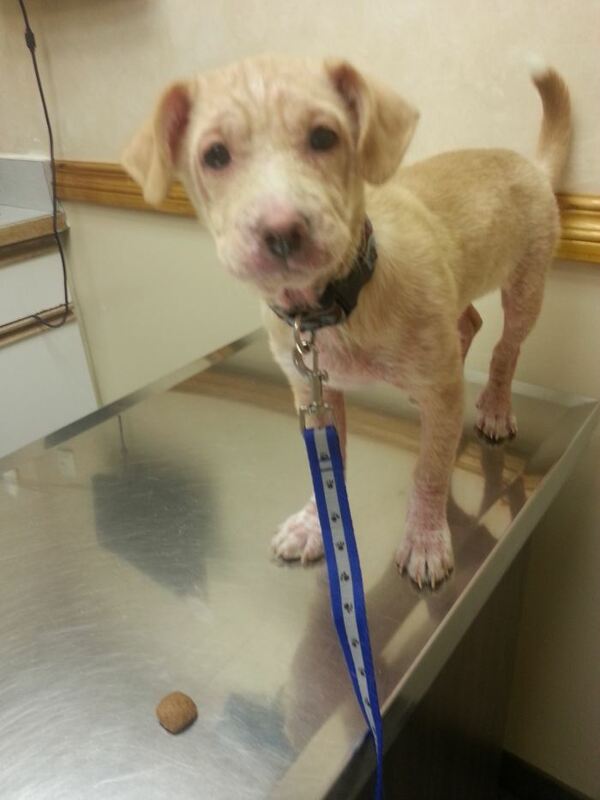 She was treated with Advantage to kill the mange mites, Cephalexin and cream for the puritis. We had the impression that not a lot of hope was held out for wee Baha, but her most recent photos tell the tale that she is making a fast and remarkable recovery. 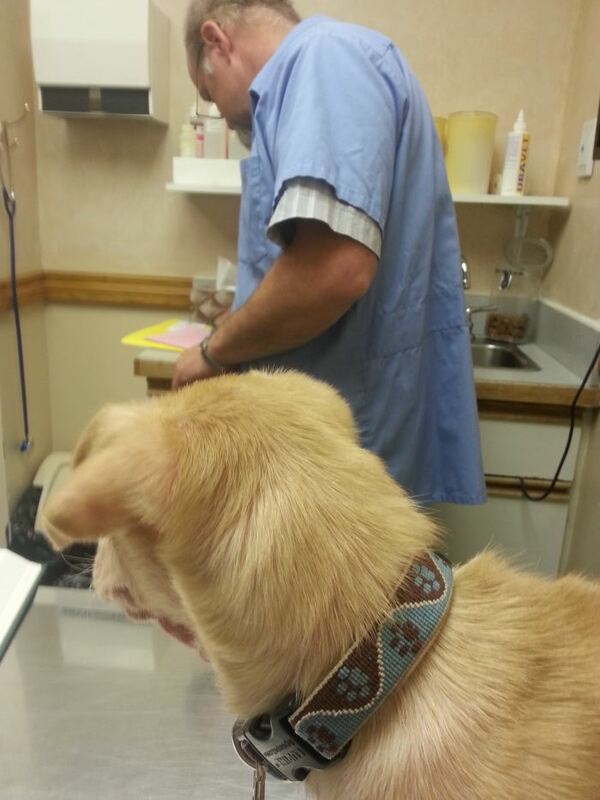 AAS will continue to pay Baha's vet bills until we get the "all clear". Because Baha is a Pitbull cross, it's very important that training in socially acceptable behaviour starts early. So we have retained the services of Tasha of Canine Home Schooling who we have worked with successfully before. When AAS rescues, it's in for the long haul. That's why sometimes AAS's own rescued dogs become "dogs for life" — the dogs too old, too unwell, or too unsocial to rehome. They are the "Keepers". True animal welfarists do not kill the hard to rehome, it treats or it keeps. Watch a video below of Baha playing with her new family! 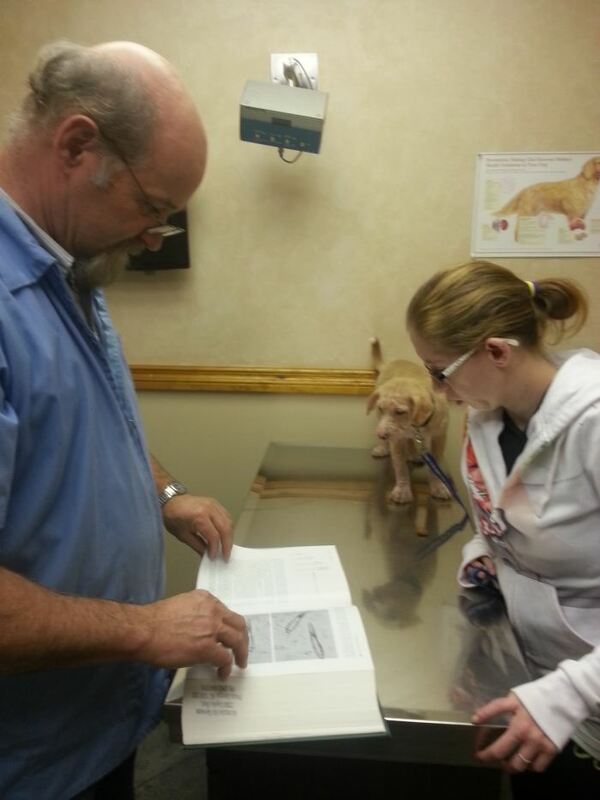 Baha's Prince George vet, Ashley Albright, conferred with a vet who specializes in mange in Ontario and it was decided to switch Baha to Ivermectin. 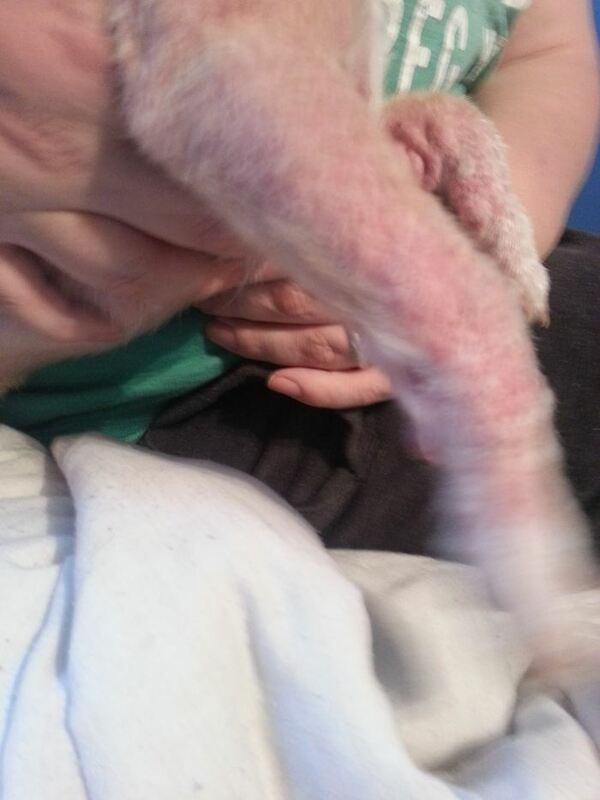 She is being switched from Revolution to Ivermectin because it works better for the rare kind of generalized (all over her body) demodectic mange that she has. Watch a video below of Baha playing fetch with her new family, and playing with her new friend Geronimo, a deaf 5-month-old purebread Blue Heeler.